The Joneses of the South are consummate entertainers. 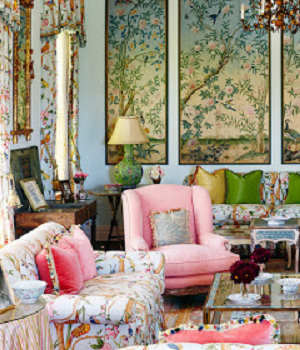 They display Southern charm, etiquette and have a home filled with the necessities to provide Southern hospitality like you have never seen before — unless of course, you’re invited to one of their annual affairs. 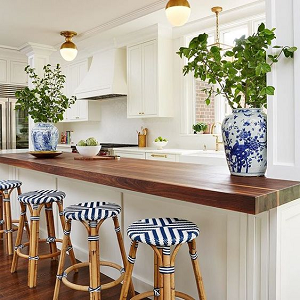 Here's how to keep up with those Joneses yourself by prepping your kitchen, inviting guests to a drink (or three) and decorating your home for true Southern hospitality. The kitchen is where the real magic happens, y’all. When you’re outfitting your kitchen, you need to cover your bases with a real stainless steel workhorse that can sear and simmer anything you can imagine and, of course, a non-stick skillet for perfect fried or scrambled eggs. These pans will become your most loyal allies through each and every gathering in your home, so treat them well. An heirloom-quality cast iron skillet can take you from stovetop to your oven and grill — just ensure you take care of your new best friend. Mixing bowls are a versatile addition to any kitchen and finding chip-resistant bowls is essential to an entertaining pro. An apron with a funny saying will spark conversation as will a Spootula — plus it's super handy! Keep your friends close and your bar cart closer. 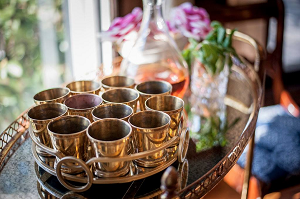 Greeting guests with a glass of Champagne or sweet tea is one thing; providing an easily accessible bar or bar cart is the next step to becoming the best host(ess) you can be. Ensure that guests feel welcome by having the essentials stocked. Barware is your time to shine. A well-stocked bar or bar cart offers guests the solution to any of their cocktail-making needs: You’ll for sure need fresh cocktail ice in a beverage bucket with tongs, a bottle opener, corkscrew, and, of course, a shaker set complete with a Boston shaker, jigger, muddler and strainer. You’ll always want to provide basic liquor options that any good wedding open bar would include: vodka, gin, rum, tequila and bourbon. If your friends are regular mixologists, St. Germain, vermouth and Campari can elevate their concoctions. And don’t forget mixers; they’re imperative to keeping your guests afloat throughout a night of imbibing. Offer guests various juices, soda, tonic, bitters and maybe even Topo Chico if you’re feeling adventurous. To be super sweet to your friends and family, cocktail sweeteners like simple syrup couldn’t be a better accompaniment. Finally, mind your vessel when choosing the right glassware for your lifestyle. Anything from breakage resistant whiskey tumblers to aerating wine glasses are great additions. Pro-tip: Don’t forget to point out your cocktail napkins and coasters! Chinoiserie is a design style popularized by Asian influence in Europe in the 18th century. Today it can be found in nearly every Southern woman’s home. From intricately designed blue and white Chinese ceramic ginger jars to Asian-inspired wallpaper, this style shows no signs of decline. A staple in the Chinoiserie interior design motif is the coveted collectible pair of Staffordshire dogs. Many are based in the likeness of King Charles Spaniels, a favorite of British monarchs in the 18th century, and while they were originally made from English clay, they are now found in ceramic. No other Victorian-era collectible has been as heavily reproduced as these bourgeois status-symbol ornaments that reside atop every Southern belle’s fireplace mantel. Beyond the Staffordshire dogs, you can channel Chinoiserie with Dalmatian and leopard print throw pillows and art prints. Add touches of bamboo, wicker or rattan indoors and out (really!) to spread this trend throughout your home. 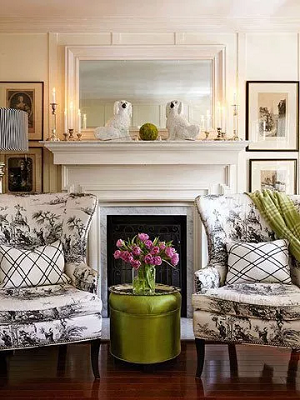 Chinoiserie lends itself particularly well to coastal areas like Charleston, Savannah and Palm Beach, but you can decorate your home in this style no matter where you live. Just make sure you truly love color and prints! Goodbye millennial pink! Reconsider the Tuscan reds and mustard yellows of the past and even the all-white and bright kitchens that were recently en vogue. Green is a new standout color of the year, and classic black and white, as well as lilac, are considered neutrals. However, no matter what trend you want to channel, keep in mind that strong colors will have an impact on the sale of your home (if you’re considering a move in the future) so choose wisely. Consider the purpose of the room that you’re painting and tailor your choice according to the emotion or feeling you’d like to evoke. A soft grey-toned turquoise can create a serene respite in your bedroom, while deep purple can conjure a feeling of royalty in a formal dining room. Guests will enjoy events you throw ten-fold if they feel like they’re being pampered. Don’t be afraid to mix patterns. Mix botanical or geometric prints across wallpaper, pillow and upholstery for a busy-but-refined unity that screams Palm Beach-chic. Similarly, keep things interesting by varying texture; a chunky knit pillow will pop next to high shine lacquered furniture or a velvet sofa. Light up your life with large fixtures like pendants or modern chandeliers. Remember, adequate lighting in your kitchen a must if you’ll be plating delicious appetizers for your guests. Similarly, think "the bigger the better" with the scale of your art. You can make more of an impact in a more sophisticated way with large-scale abstract art that either coordinates or sharply contrasts with the color of your walls. Bring life, like, actual life, into your space with greenery — it’ll also boost your air quality. Large leaf plants like a fan palm will add a resort-like feel to your home and give guests a welcomed departure from reality. If you add these essentials to your Southern home, prepare for a bevy of new friends on your doorstep!